SOUTHINGTON - The Southington Chamber of Commerce celebrated the expansion of the HillCrest Village development Wednesday, which has now entered its second phase. 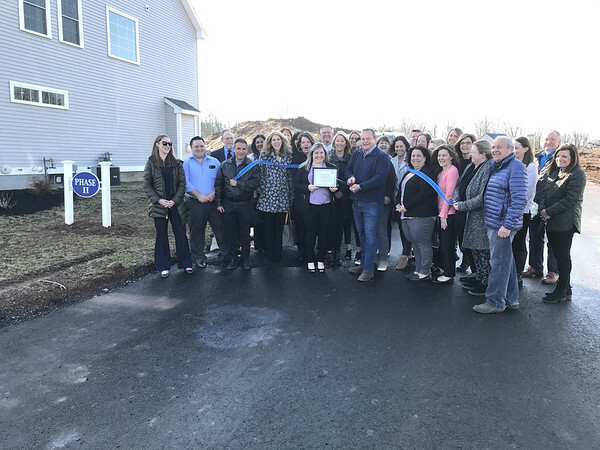 A ribbon cutting ceremony was attended by Chamber members and partners for the project including representatives from Calcagni Real Estate, project manager Ken Mita and the Iannini and Verna families. Visitors were invited to tour a furnished show-house before heading out to where construction on phase two houses was actively taking place. Sandra Fehrs, realtor with Calcagni Real Estate, said the HillCrest Village project began three years ago. Phase two expansion began last November and the road leading to this section of the village was recently put into place. Fehrs said the homes in HillCrest Village are single family, non-age restricted properties. Smirnoff added that Calcagni Real Estate is a long-time member of the Southington Chamber of Commerce and town officials were helpful in getting the project underway. Terri Eddinas, a homeowner in HillCrest Village, said she has been living there for a year and a half and likes it a lot. Taylor Crofton, executive director of the Southington Chamber of Commerce, said after touring HillCrest Village that she believes it will attract younger families to the area. Sales consultants for HillCrest Village are available Saturday and Sunday from noon to 3 p.m. and by appointment. To schedule an appointment, call 860-621-5455. Posted in New Britain Herald, Southington Herald on Wednesday, 3 April 2019 17:28. Updated: Wednesday, 3 April 2019 17:30.